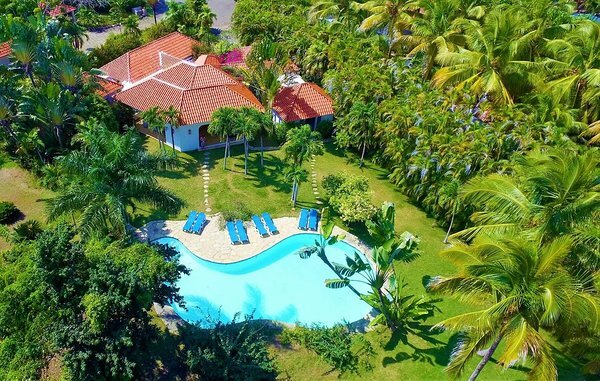 This Dominican villa rental is designed to take full advantage of its tropical setting in the midst of a mature Caribbean garden with 8 louvred doors completely opening up the large sitting room to the wrap-around terrace, which is attractively furnished for outdoor living. The dining table is located at one end, with a door leading directly into the kitchen. There is a brick barbeque on the lawn adjacent to the terrace. The large free-form pool is the focal point of this Dominican villa rental garden, with sun loungers on the surrounding terrace. Natural shade is supplied by numerous palms. There is an outdoor shower. The garden features an attractive variety of indigenous plants, including banana, papaya and orange trees, birds of paradise, jasmine, bougainvillea and frangipani. There are large areas of lawn too, with plenty of private corners for reading/taking a siesta. A hammock provides an additional quiet spot. There is a pool changing-room with WC & washbasin. The 5 bedrooms and 4 of the bathrooms are located in 2 'wings' on either side of the spacious sitting room, thus making it ideal for groups of friends, or 2 families. The 2 double bedrooms have whirlpool baths & walk-in showers, with the 2 twin bedded rooms having their own bathrooms with shower. A smaller twin-bedded room interconnects to a master double, and shares that bathroom (ideal as a family suite). 4 bedrooms have an extra bed or sofa bed enabling the property to comfortably sleep 8 adults plus 4 - 6 children/infants (sharing family bedrooms & twin, that interconnects to master). All 5 bedrooms have air-conditioning as well as fans. Bed linen is high thread-count 100% cotton or linen. Towels for the beach and bath are also supplied with this Dominican villa rental. The country-style kitchen. with white painted units and natural poplar worktops, is of ample size to cater for up to 12 guests with all the usual appliances, including gas oven with 4 burners, fridge-freezer, microwave oven, a toaster, blender, coffee press and attractive white Italian china and glassware.